Experience, discover and enjoy beautiful Scandinavia in a unique way. Read more about our Ice Drive Experience and experience it yourself. Professional driver training in winter conditions. 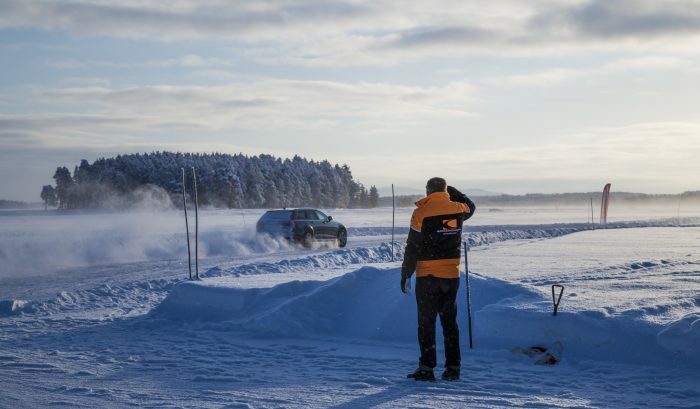 We organize a unique Ice Drive Experience every year in the ‘backyard’ of the Swedish Volvo. Here we use the Scandinavian winter conditions combined with the brand new Volvo series. It is an exclusive experience for anyone who loves a challenge and an adventure. You will drive a long weekend or midweek in brand new Volvo cars, ride on snowmobiles and make a wonderful husky tour through some beautiful Scandinavian nature. Luxury hotel, comfortable flight, everything is arranged down to the last detail. Drive, drive and drive on some of the most beautiful snow tracks. Also for 2019 Dutch Automotive Events has put together a WRM refresher course. From Monday to Friday, the driving instructors at our accommodation in Swedish Lapland will follow two courses. In addition to Vehicle Management in driver training, we also handle the Advanced Drivers Assistance Systems of our brand new Volvo cars. Of course we are also going to explore the beautiful winter landscape with snowmobiles and a husky tour, and last but not least driving on a large frozen lake is also included. Discover the beautiful mountains of Sweden with a snowmobile. Experience an unforgettable winter adventure. Discover the breathtaking beauty of Swedish Lapland with an incredible snowmobile. This is all fully included in our Ice Drive Experience. Experience an unforgettable husky tour through the snowy Swedish nature. Ice Drive Experience. Experience for yourself how incredibly beautiful Scandinavia can be in an adventurous way. Stay in some of the most luxurious hotels in Northern Europe. This experience would not be an experience if Dutch Automotive Events had not ensured that all guests would spend the night in the most luxurious hotels and lodges. It makes the Ice Drive Experience more than complete. Enjoy the tranquility, saunas and delicious food. Completely in Scandinavian style.